Simon and I first met in the mid 1980s whilst studying Maths at the University of Manchester. At that time we both liked alternative music and the Manchester music scene probably influenced our choice of university. We hit it off and were still together over 30 years later. In May 2015 Simon was working in the city in equity sales for a small US investment bank specialising in the banks and diversified financials sectors. We had been married for a number of years and had two daughters who were 11 and 14 at the time. A keen triathlete in his spare time, Simon had just returned from Mallorca where he had taken part in an Ironman 70.3 race when he started suffering from severe headaches which were bad enough to wake him up at night and were affecting his ability to concentrate at work. He visited a GP who thought it was something to do with his eyes and sent him to the Western Eye Hospital, where he was told that whatever was causing his headaches, it had nothing to do with his eyesight. Later that night I wanted to take him to A&E but he wouldn’t hear of it. As a lifelong Southend United supporter, he had tickets for the Division Two Play-Off Final at Wembley against Wycombe Wanderers the following day. He went to watch the match with the girls and whilst there, our elder daughter texted to say that he wasn’t right and that I should take him to hospital. The next morning I thought he was having a stroke as he was struggling to make a cup of tea, walked into the door frame and had a droopy mouth on one side. We went to A&E and were seen quickly. After a few tests Simon was sent for a CT scan. In my naivety, I still didn’t appreciate the seriousness of the situation. A second scan showed that Simon had a mass on his brain and he was transferred to Charing Cross Hospital by ambulance. Once there I asked a doctor whether it was cancer and he said almost certainly. I was also told that it would be better if it were a secondary tumour. I couldn’t understand how this could be the case as that would mean he had cancer elsewhere but was told that tumours that started in the brain were particularly aggressive. A full body scan confirmed that it was a primary tumour and a few days later Simon underwent a craniotomy. This went very well and all the visible tumour was removed. Simon was soon cracking jokes and came home three days later. The tumour was confirmed to be a glioblastoma multiforme and we were referred to oncologist Matt Williams. Even before we had a definitive diagnosis, I hit the internet researching possible treatment options. Matt was not convinced by many of these but suggested that we might want to try the ketogenic diet alongside the standard treatment. Simon was familiar with a high fat low carbohydrate diet because many endurance athletes adopted it. We decided to follow it because we hoped it would help but also even if it didn’t, it didn’t have the potential side effects associated with the conventional treatment. It was also something under our control at a time when everything else was outside our control. 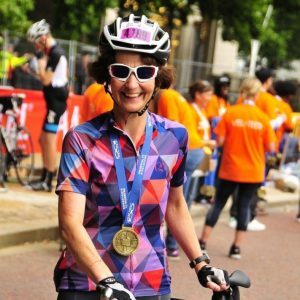 We were referred to the charity Matthew’s Friends and a dietician, Sue Wood, supported us throughout, together with a couple of her colleagues. 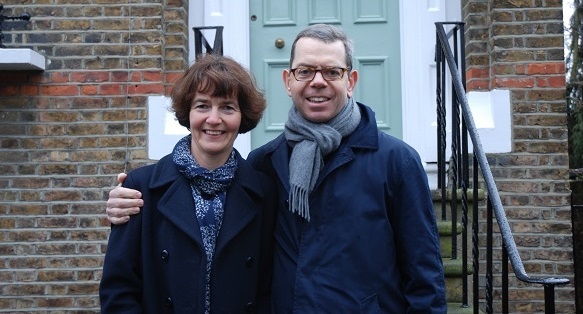 Simon sailed through the six weeks of radiotherapy and daily low dose Temozolomide, taking the tube to Charing Cross Hospital each day and even cycling on days when there was a tube strike. His treatment finished mid August and we went away to North Wales for a few days as we had had to cancel our summer holiday. Simon had also started to exercise again but had headaches if he pushed himself too hard. A scan in September was fine and Simon embarked on the next phase of his treatment which was a higher dose of Temozolomide for five days each month. Simon was surprised to find this much harder but still managed to run our local half marathon in Ealing at the end of September in a respectable time. We drove up to Edinburgh for a few days in October half term and really believed that Simon was going to beat the odds. After three months of treatment, he had a scan in November and we were expecting it to be okay as he had no symptoms. He even ran a sub 4 hour marathon two days after the scan with no real training but a few days later I noticed that his mouth didn’t look right and then he started to drop things with his left hand. It was no surprise when his consultant rang to say that there was an area of concern on the scan. There was the chance that it was pseudo progression rather than true progression so Simon was booked in for a perfusion MRI to confirm either way. Whilst waiting for the scan appointment, Simon wasn’t getting any better so he went back onto steroids for the first time since his surgery. He had started going into the office and whilst at work one day, he had his first focal seizures. He was aware that they were happening and even filmed himself on his mobile. He didn’t tell anyone at work and decided to head home. He managed to get on the wrong tube but I eventually made contact and caught up with him. We went back to Charing Cross Hospital and after a few tests were sent up to the oncology assessment ward who were expecting us. Simon’s steroids were increased and his dose of Keppra was doubled. He had a CT scan and was kept in overnight. He was very much better the next day and was allowed home as we already had an appointment for the detailed MRI in a few days time. This scan unfortunately confirmed that the tumour was definitely back. We switched to Avastin together with Lomustine and Simon was initially well and continued to exercise. After three months, a scan in February looked okay but Simon was getting worse on his left hand side so we needed to consider other options. Simon was accepted onto a trial at Barts targeting Arginine removal. We had to wait four weeks with no treatment before he could start the trial. Simon turned 50 in February and we threw a large party to celebrate. I am so glad that we did this as he saw some people that he hadn’t seen for a long time and I think he realised that he wouldn’t see some of them again. Simon set up a fundraising page so that guests could donate to Brain Tumour Research Campaign instead of buying him presents. He gave an amazing speech that made people laugh and cry in equal measure and it showed that he hadn’t lost his dry sense of humour. We started the trial but Simon continued to deteriorate and over the course of a few weeks he needed a walking stick and then a wheelchair was delivered on the day that we should have been going skiing. We also had various other aids delivered and had stairlifts installed. We decided to withdraw from the trial and went back to see Matt Williams to discuss alternative treatment. We agreed to reirradiation together with the immunotherapy drug Nivolumab which we were going to fund. The first step was to be a further scan to plan treatment. One night when helping Simon get ready for bed, I noticed that his left calf was hard and swollen so I took him to Charing Cross A&E. He was kept on an observation ward overnight and an ultrasound the next morning confirmed that he had DVT. He was given an anticoagulant injection and came home. Unbeknown to us, this had caused a bleed on the brain and the next day he was very unwell. I took him back to Charing Cross A&E and whilst trying to get him in the car he was violently sick. By the time he was seen he was barely conscious. A shot of steroids brought him back round briefly. A member of the neurosurgery team came to see me and proposed an emergency debulking operation. With no pre op scans this was never going to end well. Following a number of phone calls including one with Matt Williams, we agreed on an operation to insert an external ventricular drain. I left Simon unconscious being prepared for surgery and went home to tell the girls. This was probably my lowest point. I had been told that someone would phone but after finally falling asleep some hours later, I woke with a start to realise that I had no idea how he had got on. It took a number of calls before I established that he had been taken to neurosurgery HDU in the early hours of the morning. Simon seemed to be doing well and had his first dose of Nivolumab. The drain was removed as it had started leaking. Simon tolerated not having it in so was moved from HDU. Due to his mobility problems, we agreed that he would have the planned reirradiation as an inpatient. Unfortunately whilst waiting for this to start, Simon got an infection. There was a chance that he wouldn’t survive the night but he did and regained consciousness a couple of days later. Though he improved, he was now too unwell for any further treatment. Plans were made for him to come home to end his days and a hospital bed was delivered. On the day he was due to come home, when I arrived at the hospital, I could see that he had changed. I was told that he had hours to a couple of days maximum left and that he might die in the ambulance if we tried to move him. I didn’t leave the hospital after that and was given a camp bed in his room. He actually lived for another week and was alert for some of that time. In those last weeks in Charing Cross I got the girls out of school twice to say goodbye and each time he would rally again. Simon died with me at his side on 19th May 2016 almost exactly a year after diagnosis. He was only 50 and had been extremely fit and healthy prior to this. He faced his dreadful illness head on with immense courage, dignity and positivity in the face of adversity. I feel cheated of my future and our daughters will grow up without their Dad. After he died the charity page Simon had set up for his birthday received many more donations and friends and former colleagues have also raised further funds in his memory. A year later, I decided to do the same and was lucky enough to receive a place in the ballot for Ride London. I had done a bit of cycling but nothing like a century ride. Simon liked a challenge so I was thinking of him on the day of the race. What struck me after Simon was diagnosed was how limited treatment options are and that they don’t work very well. Brain tumours are the biggest cancer killer of children and adults under 40 yet research is severely underfunded. I sincerely hope that funds raised may help in some way to develop more effective treatments and ultimately a cure.